I BET YOUR WP HAS GOOGLE ANALYTICS INSTALLED? START USING IT! If you are like me, you spend a lot of time crafting the perfect blog post. You sit down to write the definitive post about a topic, conduct research, and endure several rewrites until you have an article that you feel is worthy of publishing. Great content takes hours (sometimes days, weeks or years) to write and by the time you are done, you are ready to move on to something else. For those of us who are not professional writers, much of this writing time goes on during a time where your readers aren’t online en masse. For example, I am writing this blog post on a Sunday afternoon. Nobody is going to read this post if I publish as soon as I get done, and posting great content prematurely can mean a death sentence for its shareability in social media. That means that I will schedule this blog post to go live Tuesday or Wednesday in order to capture as many eyeballs as possible amongst my social networks. 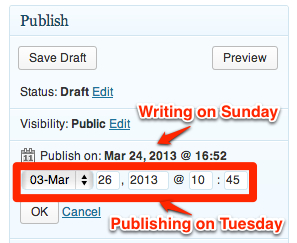 Publishing content at an ideal time often yields ideal engagement, so I need to be conscious of this when publishing. In addition to getting timing right with posting, it is also imperative that each time I publish a post that I syndicate it to all of my relevant social networks in order to drive new visitors to my site. This also helps me achieve search rankings, especially when posting to Google Plus. Side Note: In 2013, I did a study about just how important Google+ is for search rankings and the results were staggering. 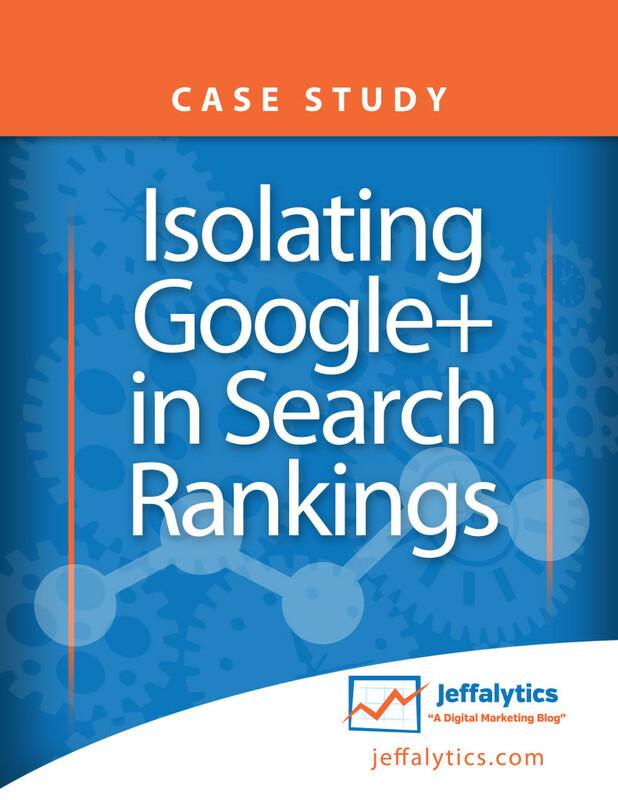 Also check out the full Google+ Search Rankings Report by clicking on the book cover to the right. If you are trying to establish your site as an authority, you need to be active on social media for your content to be found. The first step to discovery is posting to your own social networks each time you create a new piece of content. But I’m not always near a computer at the time that a post goes live, and sometimes I simply forget to promote my new post to Twitter or Google+. Other times I’m just so relieved to get the post done that I don’t even think to promote. Regardless of the situation, I realized long ago that I need to automate the way I promote content on my social networks. Fortunately, there are literally hundreds of solutions available for automatically promoting your blog posts to social media networks, with social media auto posting being a high area for innovation in recent years. Social Media Auto Posting – Which Service is Best? I started off years ago using a service called Twitterfeed to post directly from my RSS feed to my Twitter account. It worked well for many years (so well that I never had to look elsewhere until 2013). Twitterfeed closed its doors in October 2016. It didn’t always post all of my articles in a timely manner and sometimes it just forgot to post at all. This is likely because it is RSS feed driven and the feed may not have properly pinged the service, but either way it was not consistent enough for my needs. There are some quirks with the way a feed has to go into Facebook to show up with a thumbnail image that also affected how the content posted on Twitter (instead of just showing the title, it shows the first sentence of the post as well). Making edits to your feeds is nerve wracking and not advisable. Sometimes it crosses streams and shares the wrong content to the wrong network. This happened to me when I posted a personal post to the Three Deep blog on accident years ago. Not good. Many other little quirks that have not been worked out over the years. Needless to say, I have migrated away from Twitterfeed over the years and I don’t see it being a viable option for me anytime again. 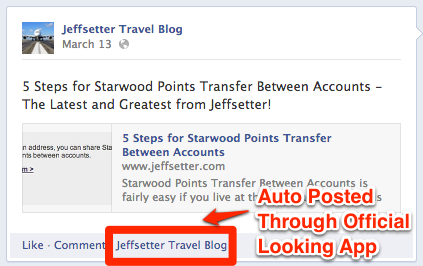 I started trying Jetpack in 2012 based on a Tweet I received from Matt Mullenweg from WordPress. I had always been skeptical of Jetpack for a while because I thought it really only worked with WordPress.com blogs (it’s called Jetpack by WordPress.com), but then I realized my perception was wrong after Matt made the suggestion. After installing, I noticed a feature called Publicize and decided to give it a shot. 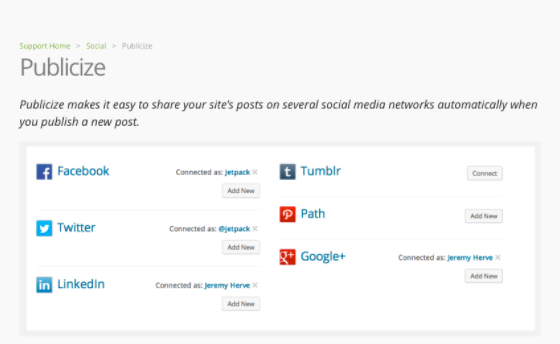 Publicize easily connected to my social network accounts and was a breeze to install, but it was missing integration with Google+ at the time, which is the network I view to be the most important network for me achieving search rankings. The other thing that I don’t love about Jetpack Publicize was that I appeared to only be able to publish to one Facebook page at a time. I could not post to my personal Facebook account + my Facebook fan page at the same time. This caused a problem for my Travel Blog, which I want to share with friends and followers (two separate populations). If it wasn’t for those two factors, I would gladly continue to use Jetpack. Fortunately, I found a plugin that does all of these things and more! In 2013 there was at least one social media auto posting tool that integrates with Google+, and that is Social Networks Auto Poster (SNAP). I came across this plugin recently and it has solved all of my problems posting my content to social networks. The SNAP API Run-Time/base version of the plugin is $49 per year to get the version that allows you to post to Google+. I gladly upgraded to this version and have never looked back. Having used applications to post to my social networks for years and always being a little disappointed with how the tools worked, I can say that SNAP is by far the best tool that I have ever used in this regard. Expect a full review and tutorial on how to use the product in the future, but for now I suggest that you give the SNAP API Run-Time of the plugin a try. You will not be disappointed. Bonus Tip: I actually have modified my auto posting of this article to send an @ message to NextScripts on Twitter to make them aware that they are my chosen winner. Maybe this will bring the article to their attention and they might even retweet or respond to the post. That’s a powerful way to reach your target audience! What do you think? Are there any other networks out there that do the same thing? Let us know in the comments! Disclosure – I originally wrote this post in 2013 to showcase my long journey to discovery. At a later date I added an affiliate link to purchase SNAP, so clicking on these links does earn me a small commission. Please note that the content of this post was in no way influenced by SNAP. My motivation for writing this post was pure.